Make The Most Of Your Space! With stackable containers, you can use that counter top space to the max. 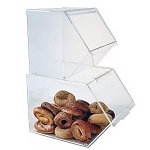 Stacking acrylic bins are clear allowing you and the customer a view of what's inside. 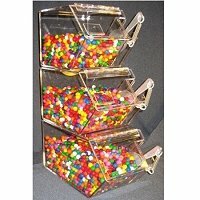 These candy bins can be placed side by side then go vertical to create the ultimate candy display. Mini Stackable Bin - 9 1/2"
Mini Stackable Bin - 11 1/2"
Mini Stackable Bin - 13 1/2"
Three major reasons you should add stackable bins and containers to your store. The storage containers save on counter space, you can offer a larger variety of merchandise and they create visual appeal. Whether you choose clear acrylic or plastic containers these stackable candy bins will let you give your customers a selection that is beyond compare. 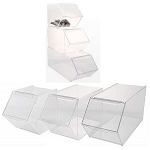 Stacking bins are available in different sizes and shapes to give you more options. 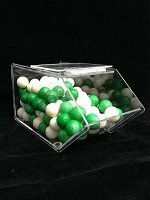 Whether you need mini bins to jumbo bins from small candy bins to a storage bin, stackables are the answer. The acrylic bins aren't just for that candy display. They work well for keeping those impulse items in a neat and orderly fashion. 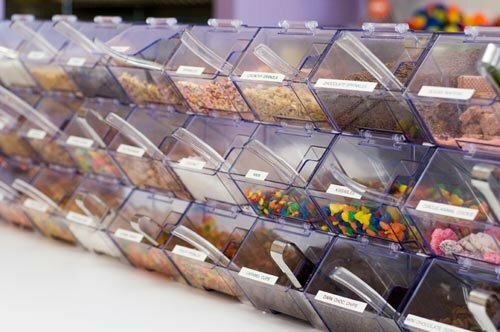 Gravity bins and scoop bins are an ideal way to display toppings for your ice cream or yogurt bar and encourage self-serve. You will be amazed at the versatility of stackable bins. Shipping of products is easy once you place your order. Get set to make the most of your space and make the sky the limit. 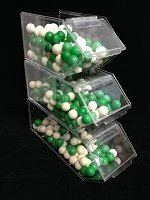 Purchase your stackables today!